The lighthouse marks the New Haven Harbor entrance inside Lighthouse Point Park. Open year round to the public. During the Revolutionary War, Amos Morris owned the land that had been in his family since 1660 where the lighthouse now sits. One night Morris heard the British approaching his property. He mounted his horse and began shouting out orders into the woods to make the British think there were Americans lying in wait. The British fell for the act and returned back to their boats. When the British eventually succeeded a few days later in overtaking the point, Morris piled everything he owned on his dining room table, and then left the property hoping the British would spare his property. The British took all his possessions, and then burned his home anyway and all the buildings on his estate to the ground, which he later rebuilt. After the Revolution, the government purchased the land and Morris became the first lighthouse keeper for only 3 weeks until it was turned over to Jonathan Finch. When Five Mile Point Lighthouse was constructed in 1805, many components were used locally. The exterior was built of sandstone from East Haven, and was hauled over difficult terrain by horse-drawn carts. The interior was lined with New Haven brick. The circular 74-step staircase was made of granite from local quarries. The lighthouse was originally named New Haven Harbor light, and then was renamed the “nickname” of File Mile Point as that was its distance from New Haven. New Haven’s historical culture boasts having a solid economy from the shipping trades, to hosting Yale University as the nation’s third oldest college, to being a major manufacturing and industrial center in the 19th and 20th centuries. In 1924 the City of New Haven purchased Lighthouse Point Park from the East Shore Amusement Company with File Mile Point lighthouse. The park attracted sports legends Babe Ruth and Ty Cobb. 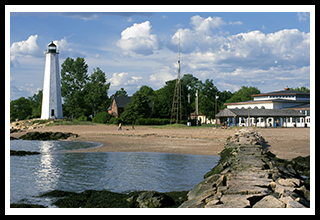 Lighthouse Point Park is one of the many parks New Haven has to offer, including concert events, museums, art galleries, and many specialty shops and restaurants. 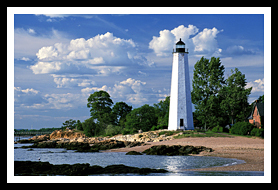 At Lighthouse Point Park you can walk out on a jetty to view the lighthouse or simply walk up to the lighthouse. View of Southwest Ledge light is about a mile from the park shoreline. There is plenty of parking for picnics and relaxing at the beach, and an old antique carousel. Several water-based adventure programs, including canoeing and kayaking are conducted at the lighthouse by the Outdoor Adventure Coordinator of The New Haven Park Rangers (phone 203-946-6768). Among the many museums in New Haven, visit the Peabody Museum of Natural History to enjoy thousands of exhibits about our earth from dinosaur fossils to saber-toothed tigers. The American Clock and Watch Museum in nearby Bristol offers the finest collection of American and foreign manufactured clocks and watches on public display. Middlebury nearby provides you with lots of fun at the Quassy Amusement Park. New Haven is surrounded by rock ridge formations that provide plenty of hiking and biking trails and spectacular views. The East Rock Park in the outer city surrounds and includes the ridge named East Rock. Visitors can climb the Soldiers and Sailors Monument up 87 stairs to get great views. The West Rock Ridge Park rises up over 600 feet above sea level. Hikers can find views from the cliff tops that span metropolitan New Haven and Long Island Sound. There are a number of hiking trails that traverse both ridges. Visitors can judge New Haven’s "Louis’ Lunch," who claims, by a declaration of the Library of Congress for its proof, to be the originator of the “hamburger” in 1900, (although technically it was a ground up steak sandwich). For hikers and bikers, the historic Farmington Canal Heritage Greenway covers a route that was once a canal, then became part of the railroad system of approximately 84 miles from New Haven, Connecticut to Northampton, Massachusetts. Over half of the Greenway has been developed as a paved trail for visitors and locals alike. Note: Southwest Ledge Lighthouse can also be viewed about a mile out from the park, but is best viewed by boat. 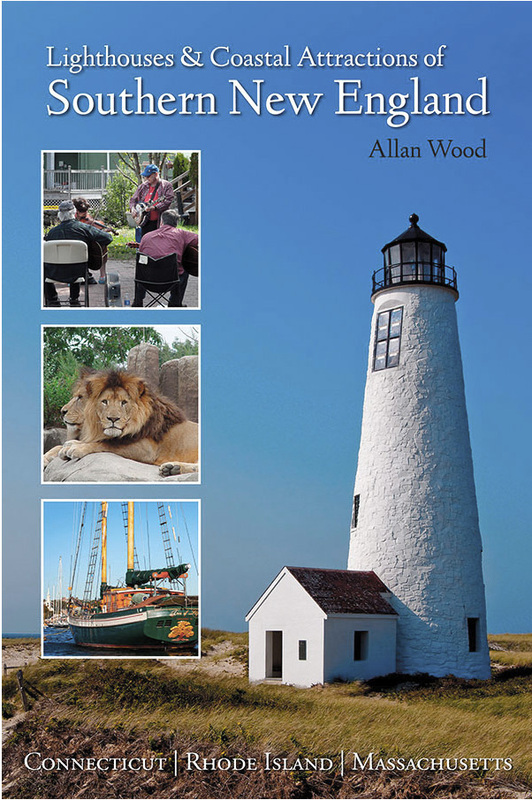 My 300-page book, Lighthouses and Coastal Attractions of Southern New England: Connecticut, Rhode Island, and Massachusetts, provides special human interest stories from each of the 92 lighthouses, along with plenty of indoor and outdoor coastal attractions around the New Haven area you can explore, and tours.